US pop queen Madonna could be the latest of a string of celebrities to pose as a model for Swedish low-cost fashion retailer Hennes and Mauritz (H and M), a Swedish newspaper said. The daily Expressen said that Madonna was in negotiations with the company. "She's a superstar, a style icon -- and controversial. Now Madonna could be H and M's next clothing model," the paper said. H and M would neither confirm nor deny the report. "Our policy is to never comment on such reports," company spokewoman Kristina Stenvinkel told AFP. The retailer announced earlier this month that Dutch designer duo Viktor + Rolf would create a special collection for H and M this autumn, to be launched in November. But it has yet to announce who will don the creations in the accompanying advertising campaign. Previous H and M models have included superstars Naomi Campbell, Cindy Crawford and Anna Nicole Smith. Last year, British supermodel Kate Moss was dropped from the group's ad campaign after allegations arose that she had taken cocaine. We received some more fan reports, which were added to our tour section. Special thanks to Neerav who has provided us a complete runwdown of the opening show, song by song. Read it here. Madonna has spoken out in defence of her controversial mock crucifixion stunt - saying Jesus would not mind. Christian groups in Britain and the US expressed outrage earlier this week after the star from a giant cross wearing a crown of thorns on the opening night of her world tour. But the 47-year-old told the New York Daily News the move was part of an appeal to audience members to donate cash to AIDS relief charities. "I don't think Jesus would be mad at me and the message I'm trying to send," Madonna said. "Jesus taught that we should love thy neighbour." As she sang the ballad Live to Tell from the crucifix, images of third-world poverty flashed across video screens and numbers ticking away represented the 12 million children orphaned by AIDS in Africa. After photos of her on the cross hit the media, the Church of England said using it as a pop-concert prop was likely to offend many Christians. "Is Madonna prepared to take on everything else that goes with wearing a crown of thorns?" a spokesman asked. A spokesman for Cardinal Cormac Murphy-O'Connor, the leader of Catholics in England and Wales, said using images the crucifixion in such a way was "a banal perversion of that magnificent event". In America, the Catholic League said the stunt was "pathetic". Having opened to fabulous reviews on Sunday night in Los Angeles, tour promoters The Next Adventure and Kyodo Tokyo are pleased to confirm that Madonna will visit Japan this September. Madonna's Confessions Tour will play the Osaka Dome on Saturday, Sept. 16th and Tokyo Dome on Wed. Sept. 20. 23 May - "The Cross" inspired by Dali? "Madonna is a well known collector of paintings by artists from the first half of the 20th century (Leger, Picasso, De Lempika, and Kahlo etc...). From the same period is the surrelist work of Spanish-Catalan painter Salvador Dali. 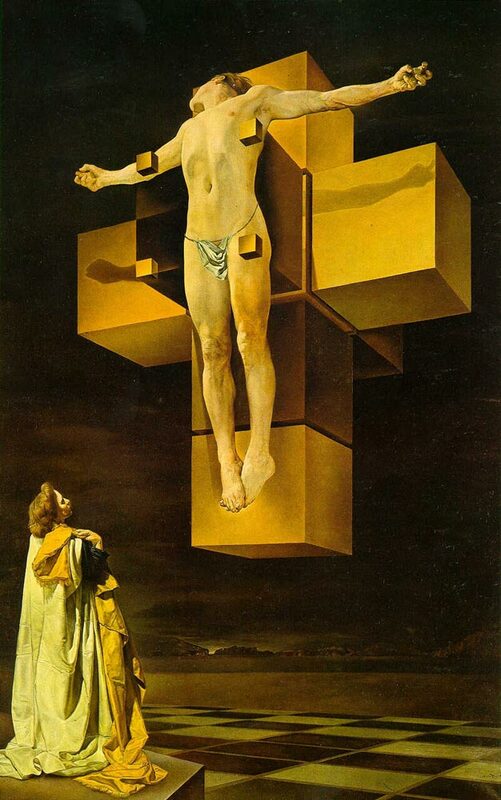 On The Confessions Tour during Live To Tell, Madonna's choice of hanging on a modern style dimensional cross instead of the traditional flat wood design is vaguely reminsicent of the 1954 Dali painting "Crucifixion"
"Metaphysical , transcendent cubism" is the way that Dali defines his picture, Madonna's cross used on the tour is not a exactly a "hypercube" as in the painting (it would have been difficult for her to both lay flat and be supported), but the dimensional cubical element in the design is an obvious similarity. Perhaps this image was an inspiration?" Fansite Madonnalicious reports: "German TV channel Viva are set to premiere Madonna's new video for Get Together on Wednesday 24 May at 3:00pm (CET) during their Viva Live show." Fansite Madonnalicious reports: "An 8th and final date at London's Wembley Arena has just been announced on London's Capital Radio. The date is Wednesday 16 August... which also happens to be Madonna's 48th birthday! Tickets for this date go onsale this Friday morning at 9:00am via the usual outlets." David Muir of the Evangelical Alliance also accused the singer of "blatant insensitivity". "Madonna's use of Christian imagery is an abuse and it is dangerous," he said. "She should drop it from the tour and people need to find their own means of expressing their disapproval." Madonna's spokesperson was not available for comment at the time of publication. CNN has posted, next to their Reuters tour review, a poll about today's real "Queen of Pop". Go over there and vote for Madonna now! Fansite MadonnaTribe reports: "According to reports from fans, Moscow and Prague are included in the list of cities in the Confessions Tour Book but without dates since there are no dates listed for any cities. Japan isn't listed but this could be due to reports by fellow fansite madonnaonline brasil that a special edition of the tourbook is being printed for Japan. Fans hoping for Japan should still count on it being included as press releases and reviews from opening night state that Madonna will be performing in Japan in September. Madonna.com reported that Madonna will be performing in Tokyo and Osaka but didn't provide dates." Check our tour section for the first press reviews and fan reports. The opening show of the Confessions Tour finished only few hours ago in LA. News agency Reuters has posted the first pictures of the show; check them here. We've received some early fan reports too. More coming soon! If you've seen yesterday's show, share your thoughts with us! Here in Belgium it's just midnight as I'm writing this, but in Los Angeles it's three o'clock in the afternoon and fans are anticipating the opening show of the Confessions Tour that will hit the Great Western Forum in 6 hours. Mad-Eyes will bring you the first press reviews and pictures tomorrow. If you're a fan attending tonights show or one of the following shows, make sure to send us your show report and we'll post it on the site! MTV is having a contest offering front row seats to the tour's opening night. Just click here to access the devoted website. If you were not lucky enough to find tickets, this is your ultimate chance! If you haven't check Madonna.com during the past few days, you should now! A behind the scenes clip of rehearsals from the upcoming Confessions Tour is now available for instant streaming. Discover some exclusive images of Madonna and her band rehearsing for the show as well as some of the dance routines and costumes by a clicking here. Enjoy! An official Madonna Confessions Tour Merchandise and Art Store, featuring fine art, t-shirts, tour programs and tons of Madonna items, is open to the public at Wild About Music (1450 2nd St., Santa Monica) from Wednesday, May 17 through Thursday, May 25, 2006. Make sure to visit it if you can! After Richmond &Tony, confessionstour.com brings you another online exclusive interview. This time, it's Monte Pittman's turn to tell us more about him, his work on Madonna's Confessions Tour and even some insider details. Just click here! Yesterday Madonna held a dress rehearsal for family and friends. Among celebrities attending the rehearsals were Lindsey Lohan, Paris Hilton, Ellen, and Portia De Rossi. Fansite DrownedMadonna reports with tons of spoilers. Read them on our spoiler page. 21 May - Gaultier fired? Most unlikely! In the past week, there've been rumours that Madonna had fired costume designer Jean-Paul Gaultier and that a young unknown artist had been reworking his costumes. However, with the world premiere of the tour happening tonight, it is most unlikely that this story is true. The costumes must've been approved by Madonna long before this week and if that hadn't been the case, Gaultier's sketches wouldn't have been published everywhere lately. Liz Rosenberg has denied the rumours, speaking of "mutual admiration" between the two. She has published some numbers and figures for the tour, which also include Gaultiers name. Liz Rosenberg has announced some funny numbers and figures of the Confessions Tour. Check them on our details page but beware that it contains some show spoilers! You can now also check the final setlist. Fansite MadonnaNation reports that, according to Warner Music Germany, the Get Together video won't be a live video, as rumoured before. It will be a studio video "in the style of Sorry". On the other hand, fansite DrownedMadonna hints at an animated video. The single and the video will be released early June, so we'll find out soon. Extra tickets have gone on sale for Madonna's gig at the Millennium Stadium. Organisers of the Madonna Confessions Tour have revealed additional tickets are available after completing a site tour of the stadium in Cardiff. The Madonna Gallerie, which features exclusive high quality art, fashion apparel and other Madonna related merchandise is scheduled to open at W Los Angeles Westwood Hotel on Wednesday May 17th and remain open through Sunday May 21st. For the fans who just can't get enough of the Material Girl, the Madonna Gallerie will present specially designed limited edition hand painted art canvases and framed photographs by premiere lens men Steven Klein, and Jean-Baptiste Mondino which cover the span of Madonna's career. There will also be a series of Madonna wine tasting events featuring wines from Madonna's new wine label. The Madonna wine tasting events will be held in the living room of the hotel Wednesday through Saturday. The wine tastings are from 7 p.m. to 9 p.m. and are open to the public. A limited line of high end merchandise including fashion T's will also be available for sale. The store will remain open for the duration of Madonna's sold-out Confessions Tour at the Los Angeles Forum from Wednesday May 17th through May 25th. A portion of the proceeds at the Madonna Gallerie will be designated by Madonna to UNICEF. 17 May - Madonna to cross picket line? Fans attending Madonna's concert in Los Angeles this weekend will have more than traffic jams and ticket scalpers to worry about -- they'll also have to contend with hundreds of union picketers. Organizers of the stage employees union have been stirring up interest in a Madonna picket since the star had a dress rehearsal at the Forum on Monday. The International Alliance of Theatrical Stage Employees has been locked out of the Forum since April 11 following a salary dispute with the stadium's owners. Jim Wright, a business rep for the union, says several hundred people are expected to rally at the concert on Sunday, and will urge concertgoers not to buy concessions or souvenirs at the Forum. Wright said the union tried to convince the star to move her show to another venue, with no luck. Will + Grace star Megan Mullally realised she was destined to become a TV talk show host when she interviewed Madonna for music channel VH-1. The star, who plays Martini-swilling Karen Walker in the hit series, will host her own daytime talk show in September, after the sitcom finishes. Mullally says, "It was a weird revelation. It was like I wanted to be a cattle rancher or astronaut, it was so out of left field." The actress isn't daunted by the many talk show hosts who have failed in the past. She adds, "I don't think that way. I'm a cockeyed optimist.